We all wish for a fully loaded fast and efficient web browser. After switiching from multiple browsers like Firefox, Google Chrome, IE9, IE 10, Avant, Opera, Lunascape etc. I finally made my choice to Maxthon 3 as a perfect browser for speed and features. Maxthon 3 is the newest member of the Maxthon family. Maxthon 3 has Dual Display Engines, two website rendering states that cover the WHOLE web in two modes: Ultra and Retro. Maxthon 3 automatically switch between them to display web pages in better quality and compatibility. You can also switch between these engines manually. Ultra Mode: It uses speedy Webkit, makes your surfing faster for newer, more current websites built to newer standards. Retro: It uses Trident (Internet Explorer engine), handles old, outdated and Microsoft IE optimized sites. Basically, Retro eliminates those moments when you go to a web page and parts of it don’t work due to its ancient code. So with Maxthon 3 you will not get troubled with “This site works best in IE” message. Just click the button in the address bar to change from Ultra to Retro (IE) and icon appears indicating that you are now using Internet Explorer mode. Again if you want to use fast Ultra mode then click button and icon appears indicating that you are now using Ultra mode. In 2012 maxthon is the most efficient and fastest web browser. Yes you read correctly-its even faster than Google Chrome!!! Use your Maxthon Passport to seamlessly sync and access your favorites, notes, even browsing settings across desktop computers and devices. Maxthon makes it easy for your web to travel with you, on your schedule. Watch video tutorial how to sync with Maxthon Browser! 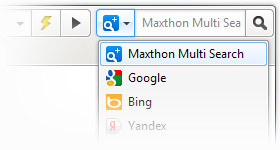 Compare search results across Google, Yahoo, Bing and any other search engine in one easy window.Watch video about Maxthon´s Multi-Search! Full page zoom in and out as you like it. Texts and pictures scale up while remain in a high-fidelity. 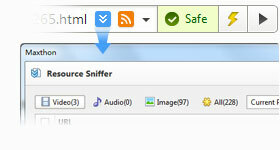 Create shortcuts of your most-visited urls Website with Maxthon 3’s URL Alias feature. Hey gamers! This one is for you. Log into the same site with multiple accounts at the same time in the same browser. Highlight a URL or words on a webpage and then drag and drop them into your Address bar to open new pages or execute a web search. Right click a tab to add all pages you are on to favorites with a new folder. Maxthon 3’s History Calendar organizes your browsing history by day in an easy-to-read calendar view. Click a day and see how you surfed. Also easy to delete items individually or by specific dates. Make a simple shape with your mouse and trigger commands like Refresh, Close Tab, Page Top/Down and Previous/Next Tab. Create your own customized actions. Shush noisy web pages and advertisements. Maxthon 3 Mute does just what it describes – shuts down all sound coming from anything in your browser. Have a clear knowledge of your IP, CPU, load speed. Speaking of video, Maxthon 3 detects if you are on a web page with video and offers you the option of opening and watching that video in a separate pop-up window, or downloading it later. Watch video tutorial about Pop-up video here! Use Split Screen to split the browser and view two windows side by side. Drag a tab to another window, zoom in or zoom out a single window, resize the windows. Great for comparisons. Watch video tutorial now! Leave no tracks. Private Browsing lets you to browse the web without *any* memory of sites visited or files downloaded. Ad Hunter blocks any advertisements and malicious pop-ups before they load. Edit the rules to hide any elements in pages, or click to subscribe to rules that cover commonly-visited websites. Upload a photo or choose one of Maxthon’s avatars. Dress up your Maxthon by changing its skin. With a simple click, you get a new look of browser instantly. Download: My recommended skin (use this skin after installing Maxthon 3 to get following sleek interface). Other skins: Maxthon 3 skins collection. Get the browser that works the way you want it to.Watch this tutorial to learn how to easily customize your Maxthon browser! Maxthon is available in 26 languages. Maxthon 3 offers built-in spell checker in : English, Russian, Italian, Czech, Portuguese, Polish, German, Turkish, French, Spanish. Just click to translator tool and Maxthon 3 translates any foreign language with the help of Google translate. I hope that Maxthon 3 will bring an end to your perfect browser search and you will be happy to use the fastest fully loaded web browser on earth.